Two of the most important things we can do for children in need are provide them with a healthy, safe living environment, and give them an educational foundation for a better future. During my recent trip to Indonesia in early February 2015, I learned first-hand how Plan’s field offices are putting the generous resources supplied by our donors to good use, and helping underprivileged communities achieve these goals. Ms Kanie Siu, CEO at Plan International Hong Kong witnessed an emergency preparedness team in action during her visit to Indonesia. Children demonstrate their knowledge of the safest places to go when disaster strikes. 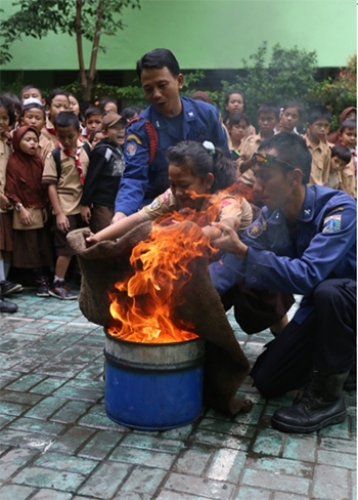 One of Plan International’s most important causes in Indonesia is promoting child safety. Early in my sojourn we travelled to a rural area outside West Jakarta to see the Urban Safe School Project in action. This three-year campaign is helping create safer school environments for children in disaster-prone urban communities, reaching more than 6,000 children and their teachers across 20 schools. The first step is to grow a culture of safety awareness, and then to build expertise in school-based emergency preparedness actions. Our visit included an informal discussion with a student emergency preparedness team and a short quiz session with teachers. That afternoon we went to the Rawa Bunga primary school to watch a large-scale fire simulation involving roughly 1,000 participants, including students, parents, school committee members and the Jakarta fire brigade. Fun, educational activities like board games help children learn more about disasters and how to prepare for them. Members of the local fire brigade demonstrate the importance of fire safety to students and teachers. This evacuation route map provided by Plan project staff clearly shows the safest routes for students and teachers to take in the event of a disaster. Keeping children safe also means keeping them off the streets. One of the most vivid memories from my trip is meeting Ridwan. A 15-year-old boy with a Year 4 education and no birth certificate – and therefore no proof of his identity – Ridwan was selling food and busking on the streets and was at high risk of arrest. 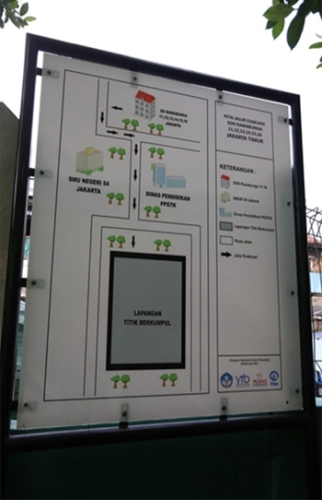 But then he found Yayasan Rumah Kita, a Plan Indonesia partner organisation that works to get children back into schools. Ridwan was finally able to get a birth certificate thanks to Plan’s “Count Every Child” universal birth registration project, which means he now has proof of identity to keep him accounted for and, more importantly, off the streets. Also, Ridwan will be able to sit the national exams once he completes his education. Ridwan is just one of hundreds of young men who has gone back to school to continue his education, thanks to the support of Plan donors. I was especially touched when Ridwan told me, “Knowledge can be shared”. His mother used to say this to impress upon him the importance not only of gaining knowledge at school, but also having a healthy outlook toward learning throughout life. Because of Count Every Child, Ridwan is getting a second chance. Because of his mother’s wisdom, he is keen to share what he learns, and now he hopes to make a difference in the lives of others as a teacher. Another important Plan youth initiative in Indonesia is our partnership with Hyundai Motor Company and KOICA, the Korea International Cooperation Agency, to bring valuable automotive skills to the country’s workforce. Over 22 per cent of youth between the ages of 15 and 24 are currently out of work, while the country’s labour participation rate hovers at just around 70 per cent. The consequences of unemployment are dire – without legitimate means to earn a living, young people are tempted to turn to crime to make ends meet. The automotive industry, which has been growing at an average annual rate of 20 per cent over the past five years, has been identified as one of the five key industries that can help drive the Indonesian economy and provide much-needed jobs for thousands, including young people. A trainee shows his new skills at the Youth Economic Empowerment (YEE) project centre in East Jakarta. In response, Plan Indonesia, Hyundai and KOICA introduced the Auto Mechanic Skills Development Project, organised under Plan Indonesia’s Youth Economic Empowerment (YEE) programme. I visited the YEE automotive project in Pulo Gadung, located in east Jakarta, on February 3. This three-year project, which began in December 2012, set out to train 500 youth – male and female – in auto-related skills to help them find employment or self-employment. The first year was dedicated to constructing a mechanic workshop, followed by a two-year training programme. I was deeply impressed by the expertise and organisation that Hyundai and KOICA respectively brought to the project, and even more so with the skill level the trainees had developed in such a short time. In many ways, this is the epitome of a Plan effort; it is helping create opportunities for further education and making communities stronger through better employment prospects. Most importantly, the project has already put 450 young people into the automotive workforce, while 50 others have opened their own repair shops. Ms Kanie Siu, CEO at Plan International Hong Kong with children at safe school in Jakarta. I flew back to Hong Kong wishing I could have spent even more time with our hardworking staff, partners and beneficiaries. I especially wanted to meet more people like Ridwan, and hear more stories about the brave young women and men who are forging new paths of hope. Until my next trip, I will be satisfied with the knowledge that our supporters and donors in Hong Kong are making lasting impacts on the lives of those less fortunate, and helping youth across Asia, Africa and the Americas achieve safer futures.